One step to ensuring a really good gardening season is knowing in advance what needs to be done and when it needs to be done. This will help you to avoid planting things too late because you weren’t ready or didn’t have the right supplies on hand at the right time. This is my seed starting schedule from my ListPlanIt membership. It’s simple as can be, but it forced me to take a bit of time to think through what I need to do this winter and spring to have everything ready for the garden when I need it to be ready. It took me about 45 minutes to do the quick but necessary research to complete mine. Figure out which plants are going to need to be started or prepared early. You can see my list above. The only one I may not actually start early indoors is cucumbers, as I have good success with them straight in the ground, though getting a slightly earlier harvest would be really nice. We’ll see. Determine your last Spring frost date and your first Fall frost date. Here’s a good site for Americans. Canadians, try this one. I just wrote both dates at the top of my seed starting page for easy reference (and you can see that I wrote the wrong ones first and crossed them out- this doesn’t have to be perfect or polished!). Figure out how long each type of seedling should be started before being transplanted out to the garden. I found this page at Victory Seeds helpful, as well as this one at the Old Farmer’s Almanac. I looked up the number of weeks that each type of seedling needed and wrote it in the upper left corner of the Sowing Date box. Figure out when those seedlings can be transplanted to the garden. I didn’t write exact dates, but just a general time (ie early April or mid May). Again, I got these off of the links in #3 and partly from my experience from past years of what worked well. Get out a calendar and count backwards. Take your transplanting/outdoor planting dates and go back however many weeks you’ve specified that each seedling needs, and that will give you your Sowing Date (the day you start your seedlings). For example, my broccoli and cauliflower seedlings can go outside as soon as it begins warming up and nearing my last frost date, around late March or early April at the latest. They need 6 weeks to grow indoors, so that brings me back to late February to have them started. Write any other notes that feel relevant to you. I noted how many of each seedling I would like to start and put that number in my Notes box. I would like to start 12 each of cauliflower and broccoli, so you’ll note the 12 there. For my tomatoes, I want to start 3 seedlings of each type I’m planting (one cherry and 5 other tomato varieties). The plan is to actually plant 2 of each variety, but I want to start 3 of each just in case I have one that doesn’t do well for some reason. That’s it! A little bit of research and effort, and now you have a blueprint for your seed starting and transplanting. This page could also easily be used for all of your other seeds that will go straight into the ground. Just skip the Sowing Date column and only write down the approximate time that you will plant these seeds directly into your garden. To get ready for your garden even more, a next step would be to draw yourself a garden layout plan. You can see some examples of mine from last year in this post on succession planting. I haven’t yet made mine for this year, although it is in the works. This is a very helpful tool to make sure that you have room for all that you want to plant and to start thinking strategically about which vegetables will go where (and why). One excellent book that I am referencing as I make my layout this season is Carrots Love Tomatoes, a book on companion planting. 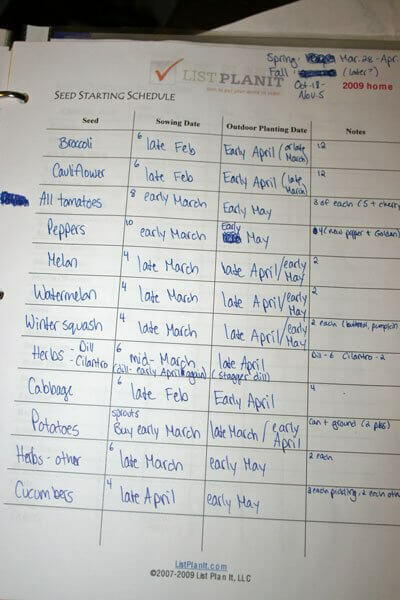 How do you plan out your garden seedlings and planting? Have you started to make your plans for this gardening season yet? I just wrote this out my to-do list, starting with researching on when to start my seeds for my garden this year! It will be our 1st family garden since the wee early years of 4-H, that my dad helped me with almost 20 years ago. Thanks for the great info to add to his great knowledge! I’ve been looking at gardening things since December. I had a garden, I guess it was three years ago now. But two years ago, my brother passed away around time to start planting, so it didn’t get done. Then, last year, i wasn’t in the mood, at all, to plant a garden. SO, this year, I’m anxious to get started. I’m looking into square foot gardening. Should be great fun with three little boys to help. Shortened story, Thanks for the information. I’ll do this next. .-= Becky C´s last blog ..Starting Over =-. .-= Sarah @ Mum In Bloom´s last blog ..WFMW: Thrift Shoppin’ for Vintage Books =-. I’m a newbie when it comes to gardening – this is my first year at attempting one. I planned out my garden layout on graph paper……each square represented 1″. Then I knew how big I needed to make my garden and how much space each plant needed around them to grow properly. 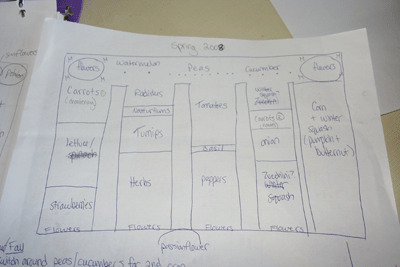 .-= Kalyn´s last blog ..Garden Plans =-. Stephanie, this is EXACTLY what I needed to feel that I can do a garden! I felt overwhelmed with all the variables for planting, transplanting, frost dates, etc. But that’s only a small fraction of what I need to get me going – what I really need is a LIST!! Thanks so much. Just started figuring out which varieties we want to redo or try new ones this year. Then my list is next! You obviously start alot of your seed indoors. Where do you put it all? How do you keep your children out of it? Or do you have a greenhouse? I would love to start alot of my plants earlier but have nowhere to start them. .-= Alisa´s last blog ..Am I Crazy? =-. Thank you for posting this. We once had a big garden in our backyard and have tried our hand at raised beds also. This year we are wanting to do a big garden again and this was just what I needed to get my thoughts gathered. Thanks again! .-= Adriane´s last blog ..Our Tot School – Week of January 18 – 22 =-. This being only year 2 with a container garden I haven’t done much planning…I’m still new at this! Thanks for all the links, though, those are a great help! .-= Kait Palmer´s last blog ..Challenge Days 12,13, Ode to Le Creuset and Krochet Kids =-. @Alisa, I do start them indoors, and yes, there are lots of them! I bring my outdoor patio table (which is a large rectangle shape) into our school/family room to do it. The table is high enough that my 2 1/2 year old can’t grab things off it really easily, though my 5 year old can, of course. I put the seedlings inside large plastic seedling containers. Each one holds about 30 seedlings if I use the smaller peat pots, or about 20 if I use the larger ones. It’s not completely ideal because it’s actually the only room of the house that DOESN’T get any direct sunlight, due to the eaves over the patio right in front of it. I wish I could choose a different room with better light, so my seedlings didn’t get quite so leggy. The other room with good light (the living room, the dining room, etc.) just aren’t really suitable, though. This year I am going to try adding artificial light through extra lamps during the daytime to see if that helps keep my seedlings a bit stronger and less leggy. And I only dream of a greenhouse… maybe one day! A cold frame can be very helpful. and pretty simple. An old window and some bricks can get you started. Thanks for this!! I’ve been doing the exact same thing this week. I’ll have to compare notes 🙂 I’ll be sharing my plans on my blog soon too. I just don’t know how you do all this stuff … especially with three little people in your house. You’re amazing … and such an inspiration to lazy people like me. Keep the gardening tips coming! I’m just about ready to give up on my second garden due to cold weather. I have a greenhouse where I plant everything in the ground – it’s the only way to really get any harvest in the Colorado mountains! It seems I can never learn enough for the next year!